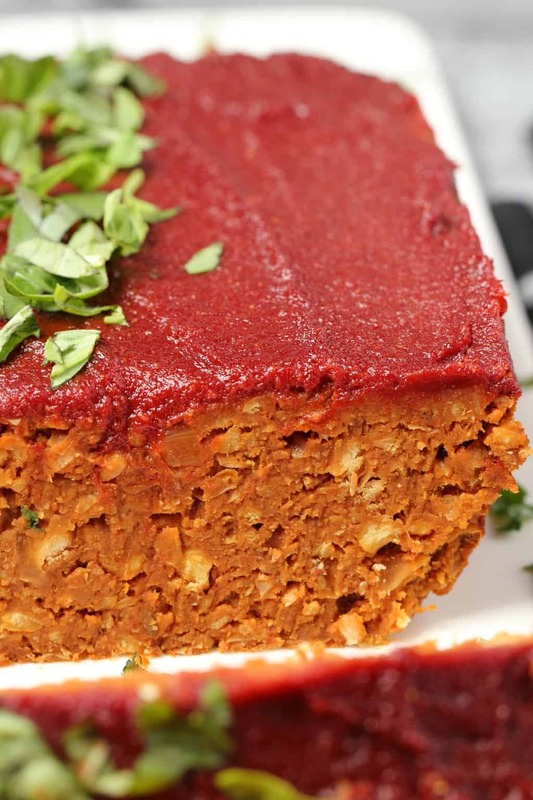 Hearty and satisfying vegan meatloaf. 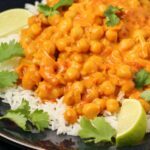 This deliciously simple comfort food is richly flavored and glazed with a sweet and spicy tomato sauce. 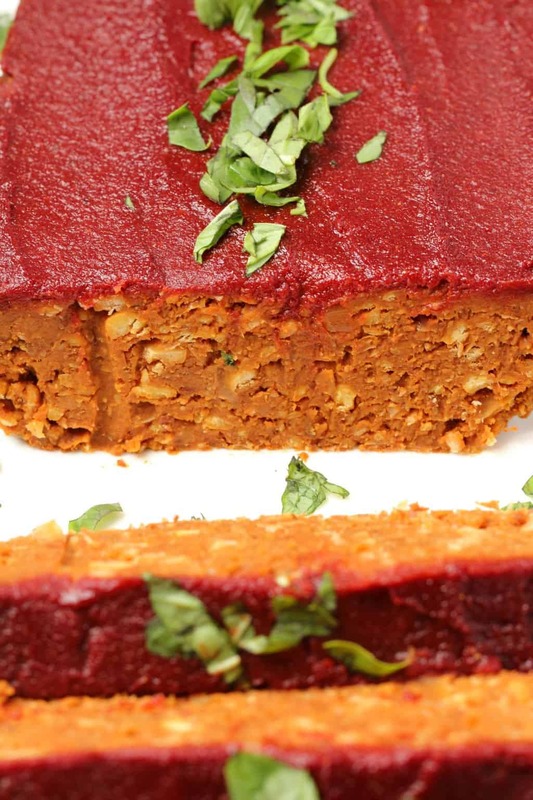 I can hardly even believe how good this vegan meatloaf is! Even before it’s cooked it’s so damn good. Don’t taste the mix before you cook it, you guys! You’ll just want to eat it just like that, and you can too. It’s all vegan and ‘pre-cooked’ so nothing bad would even happen if you did, but patience…it gets even better when cooked. 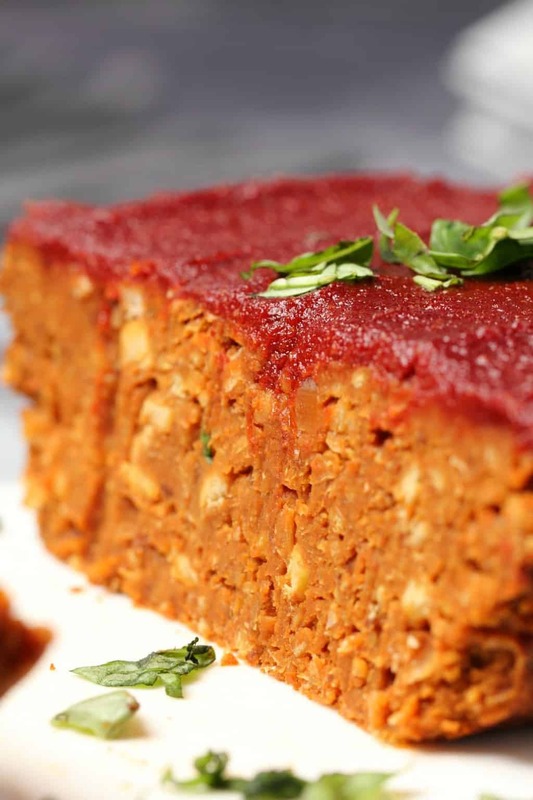 The vegan meatloaf itself is based on chickpeas. This is mixed with onion, garlic, some homemade breadcrumbs – and when I say ‘homemade’, I mean I put some sliced bread in the blender and made breadcrumbs – some sweet chili sauce, dijon mustard, soy sauce, ground flaxseed meal, nutritional yeast, tomato paste and cayenne pepper. You sauté the onions and garlic in some olive oil, then you mash up the chickpeas with a fork, the object being to keep it quite chunky but not too chunky, add in all the other ingredients and mix into a thick batter. Then you place it into a parchment lined loaf pan and smooth it down. 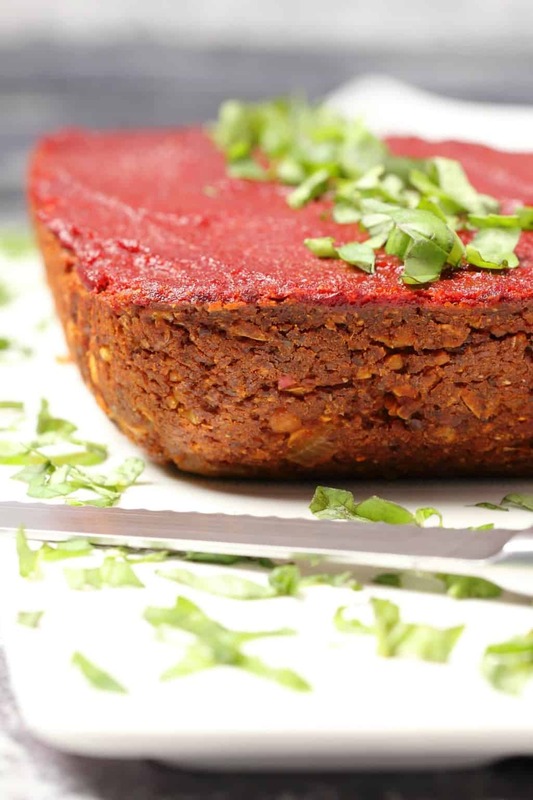 Bake it for 30 minutes covered with foil and while it’s baking you mix up a delicious tomato glaze of tomato paste, brown sugar, maple syrup, garlic powder and paprika and spread that out on top! Bake for another 15 minutes (uncovered) and voilá! The crucial part is actually using parchment paper to line your loaf pan but not just to line it, but to actually have the parchment paper so that you can lift the entire vegan meatloaf out of the pan with the parchment paper. This is because the meatloaf isn’t super firm when it comes out of the oven, and the glaze on top is still quite wet, so you can’t be tipping it over onto your wire cooling rack the way you would a loaf of home baked bread! So that is really crucial. The texture is really perfect almost right away, you just need to let it cool for around 10 minutes after coming out of the oven, and then you just lift it right out with the parchment paper onto a wire cooling rack, let it cool around another 10 minutes and then serve. 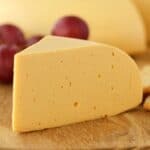 This would be wonderful served with some vegan mashed potatoes or even just alongside a simple salad. It doesn’t need gravy because it’s not at all dry, but if you do want to serve with gravy, well that would be awesome too. Especially if you’ve got some vegan mashed potatoes on the side. 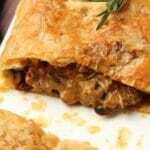 We have a wonderful vegan gravy recipe and a vegan mushroom gravy recipe, either of those would be great. If you want to serve this with gravy you could forego the tomato glaze, but it’s so good I don’t recommend missing out on the tomato topping. Leftovers are amazing! 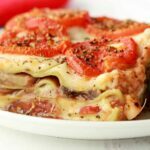 So you will love love love having leftovers of this! This is totally divine served completely cold, it is not a requirement in the slightest that it be reheated (though you can go ahead if you want! ), so this is ideal for lunches the next day. 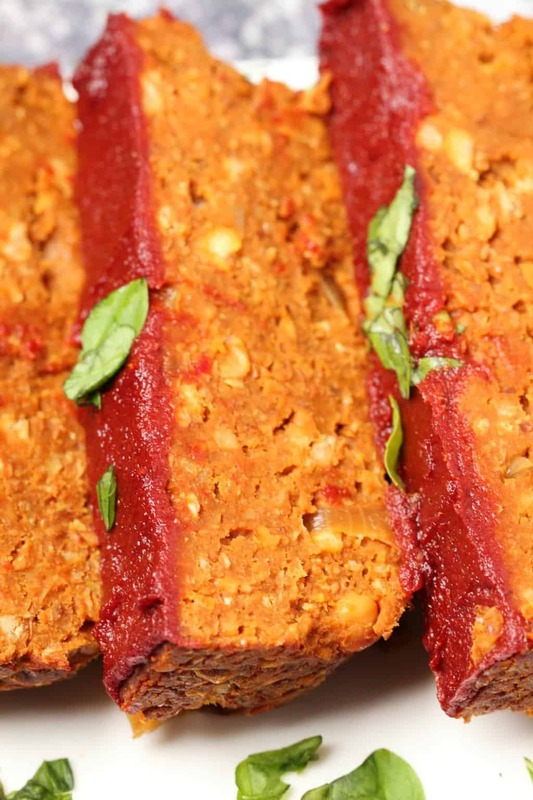 What do you think of this vegan meatloaf? Let us know in the comments! And please rate the recipe too! Thanks so much! 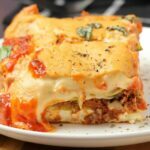 Sign up to our email list while you’re here, you’ll get an awesome free recipe ebook and you’ll be the first to know when any new recipes are posted to the blog! Add the chopped onion and crushed garlic to a frying pan with the olive oil and sauté until the onions are softened. Preheat the oven to 375°F (190°C). 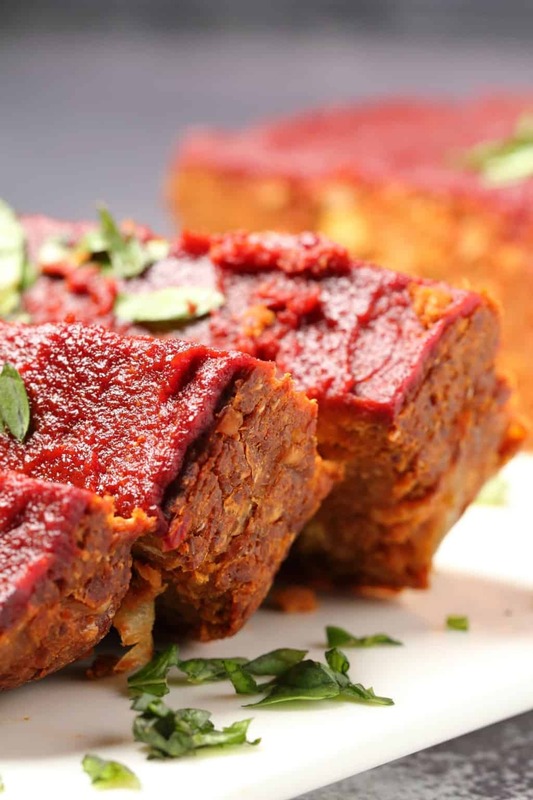 Spray a loaf pan with non-stick spray and line it with parchment paper so that the meatloaf can be easily lifted out. Set aside. Drain the chickpeas and add to a mixing bowl. Mash with a fork until roughly mashed. Add the breadcrumbs, soy sauce, sweet chili sauce, dijon mustard, flaxseed meal, nutritional yeast, garlic powder, tomato paste and cayenne pepper to the mixing bowl. Add in the cooked onions and garlic. Mix very well into a thick batter. Make sure everything is evenly mixed (it’s a very thick mix). Transfer this into the parchment lined loaf pan and smooth down with the back of a spoon. While the meatloaf is baking, mix the tomato paste, brown sugar, maple syrup, garlic powder, salt and paprika in a bowl and stir together. When the meatloaf has baked for 30 minutes, remove it from the oven and remove the foil. 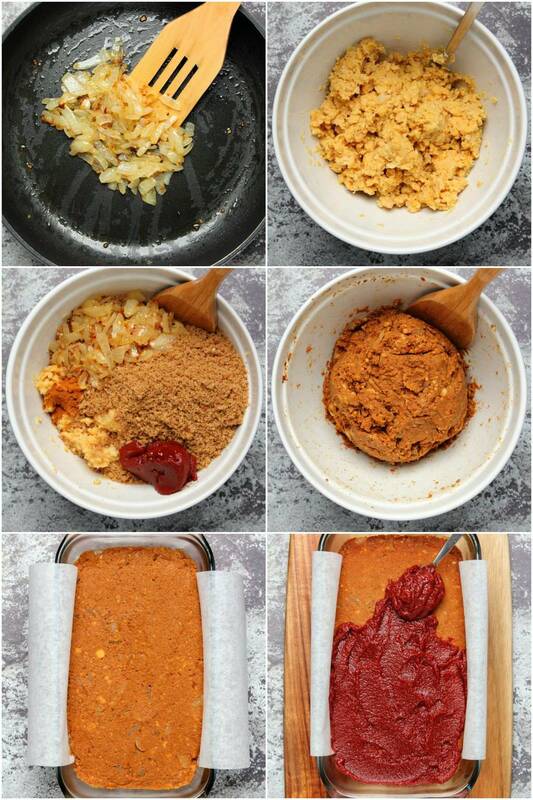 Spread on the tomato glaze evenly and return it to the oven, (no foil, uncovered) to bake for a further 15 minutes. Remove from the oven and allow to cool for at least 10 minutes before removing from the loaf pan by lifting the meatloaf out with the parchment paper. Slice and serve with fresh basil. *I used 4 slices of a regular pre-sliced thick cut sandwich bread for the breadcrumbs. It makes around 2 cups of breadcrumbs. Please note that if you use a store-bought version of breadcrumbs instead that you will then need less than 2 cups. This recipe was designed around the use of homemade breadcrumbs, so using store-bought breadcrumbs can result in a consistency that is too dry. If you are subbing a store-bought variety, add them in slowly and don’t use as much as 2 cups. I have not tested this recipe with a store-bought version so can’t be sure of the measure that will work best. It will be most accurate if you make your own breadcrumbs for this recipe. *The tomato glaze is so good that we sometimes double it and use all of it for a thicker tomato glaze topping! If you like it as much as we do, you might want to do the same. 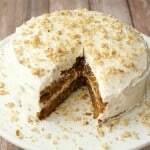 *This recipe was recently slightly updated and improved. 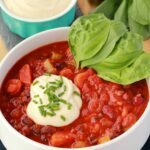 *Recipe inspired by Connoisseurus Veg and Simple Vegan Blog. Amazing and non vegans love it too!!! 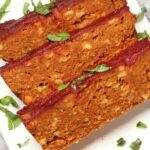 I’m so thrilled to have discovered Lovingitvegan! 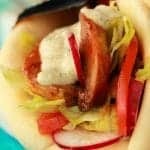 My life is so much happier partly because I get to cook with my boyfriend in trying these exciting recipes! 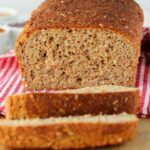 Made this loaf for dinner tonight and it was great! Added some chopped walnuts for texture. Thank you so much for all the recipes! They always work out so well!! So delicious – especially the glaze on top. Already thinking about what else I can use that on. Next time, I might try adding another tablespoon or two of breadcrumbs, just to see if it helps firm it up a bit. So true – it was absolutely fabulous cold the next day, too! I wasn’t sure about how much onion to use. Ended up using a fairly large one (maybe one cup, chopped?) and it was not too much at all. I’ve made this several times now and each time it gets better. Along with the Tbs. Sweet Chili Sauce in the tomato topping I also add just a Tbs or so to the chickpea mixture also. Even my non-vegan friends enjoy it. Thanks Allison for so many wonderful recipes. I’ll be commenting on others that I’ve made too. Thank you for this delicious recepie. We loved it . I made this recently and shared it with my non vegan co workers. Everyone LOVED it. I made mashed potatoes with it and some nutritional yeast gravy. It was so good. Can’t wait to make it again. I would love to make this recipe- it looks so good- but we are doing Bright Line eating, so we can’t have the bread crumbs. What do you think would be a good, non-bread option to replace them with? The glaze is delicious! 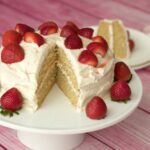 I agree that you need to make a double batch for the glaze on this recipe! I’ve just made the meatloaf but the mixture was a pile of breadcrumbs even though I followed the recipe exactly. Any idea what went wrong? I’ve made many other recipes by you and all have been absolutely brilliant. Hi Helen, I’m not sure what you mean, do you mean it wouldn’t mix properly before it went into the oven? I would just add a bit more liquid, even just a spoonful of water to make it mix, the mix is supposed to be fairly dry as you can see in the video, but it definitely is supposed to mix. Hi back, yes I used half Panko and half regular ( store bought). That’s a good point, they would be much drier then homemade…..I will make my own next time. Thanks for your feedback, I am a new vegan and on a learning curve when cooking. Are you supposed to mix the flax with water so it can work as a flax “egg” binder?